AUSTIN, Tx — As members of the same conference, Texas has one win at Kansas State. That win occurred 16 years ago when Texas was out-gained but not outscored by a Wildcat offense that had Ell Roberson and Darren Sproles leading the way. 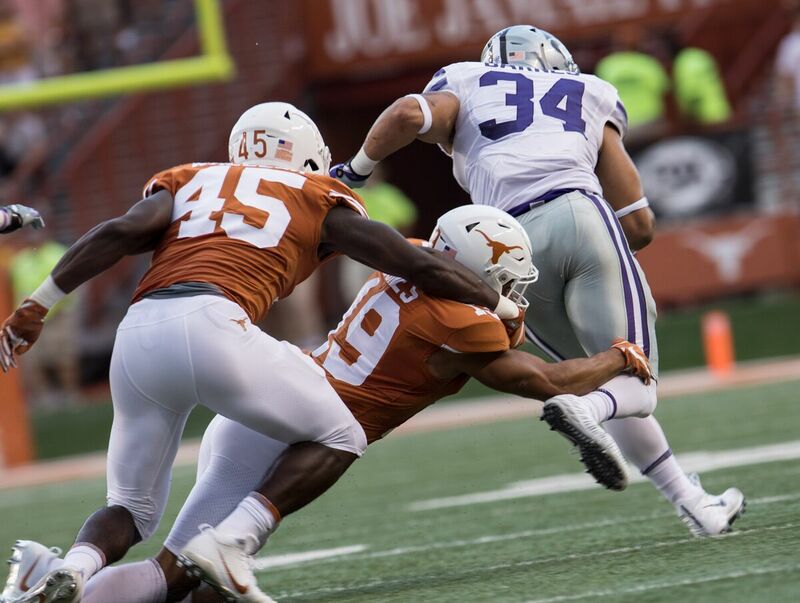 The Longhorns forced five fumbles during the game, but only recovered one. Chris Simms had a pedestrian game adding Texas’ two necessary touchdowns through the air to BJ Johnson and David Thomas, but it was a better game than the Texas rushing attack had. Cedric Benson and Selvin Young combined for 63 yards on 27 carries. Looking at the box score, the Wildcats looked to have the clear advantage. However, Dusty Mangum hit his only field goal attempt of the game from 27 yards with 1:32 left in the fourth quarter. KSU would set up an opportunity to tie with a few seconds left, but Marcus Tubbs blocked a 36-yard field goal to preserve Texas’ tight victory over the No. 17 Wildcats. 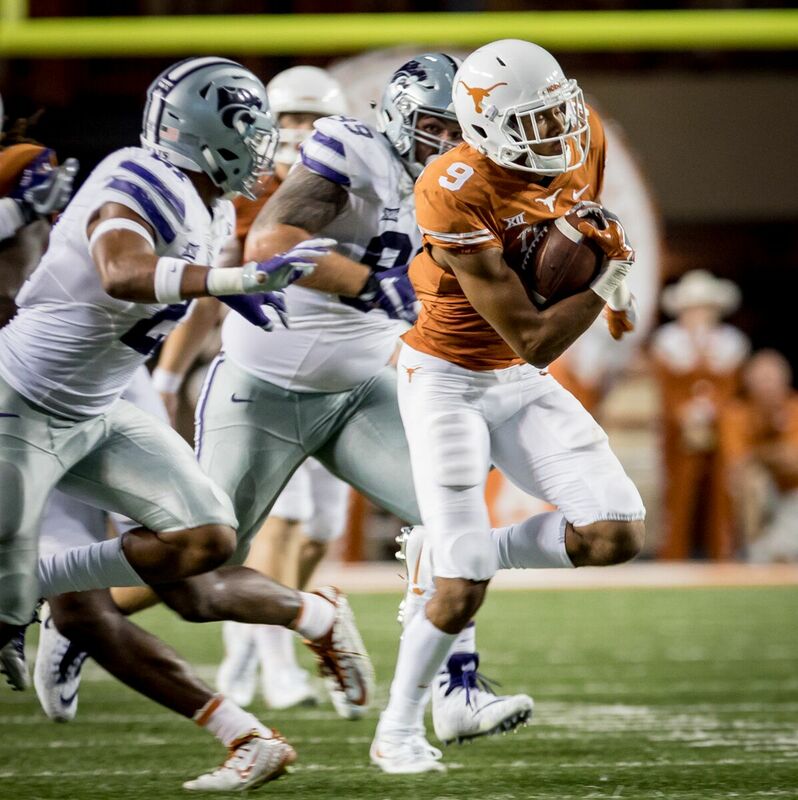 As Tom Herman noted Monday, star freshman safety Caden Sterns was just two years old. Since Tubbs got his hand on the football in that Manhattan night, Texas has lost five consecutive contests in what is now known as Bill Snyder Family Stadium. One of those losses came against Ron Prince. Manhattan hasn’t been kind to the Longhorns. 1998 – Kansas State came into this game as an early season national title contender in Snyder’s tenth season since taking over what was called “Futility U.” Ricky Williams struggled averaging 1.7 yards per carry on 25 carries. Major Applewhite added the only score on a touchdown pass to Wane McGarity. Michael Bishop found Darnell McDonald for 11 of his 14 completions for 159 yards and two scores. Three different rushers added scores on the ground as Kansas State cruised past Texas on its way to winning the Big 12 North. 2002 – Texas’ lone win in Manhattan as members of the Big 12. 2006 – Ron Prince replaced Bill Snyder after his first retirement, and current Penn State coach James Franklin’s offense put 45 points up compared to the Longhorns’ 42. Colt McCoy left the game following the first drive after a QB sneak for a touchdown and was replaced by Jevan Snead. Snead and KSU’s Josh Freeman dueled the rest of the way. 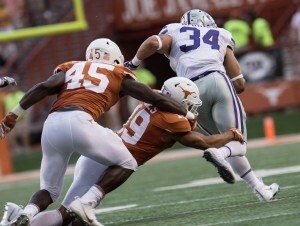 Texas allowed just 23 yards rushing on the evening, but Freeman was 19-of-31 for 269 yards and three scores. Chris Ogbonnaya’s one yard run at the end brought Texas within three, but the Longhorns couldn’t recover an onside kick, and purple masses stormed the field in celebration. 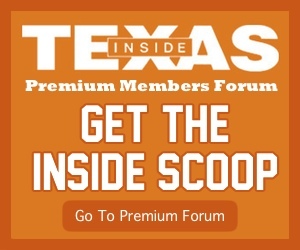 2010 – Texas drives: Downs, INT, Punt, Punt, Downs, INT, INT (Half), INT, INT, Punt, Punt, TD, Punt, TD. Garrett Gilbert completed more passes to the other team than Collin Klein even attempted. It was bad. 2012 – No. 6 Kansas State downed No. 18 Texas 42-24 to win the Big 12 Title. DJ Monroe had one carry for 46 yards. Johnathan Gray had touches 12 for 29 yards. Collin Klein had another Collin Klein-type game, rushing 23 times for 103 yards, for two scores, while passing for one more. John Hubert added three scores himself as Texas dropped to 8-4. 2014 – After a thrilling 48-45 victory over an Iowa State Cyclone team that left Shawn Watson… emotional, Texas went on the road to play No. 11 Kansas State. The Longhorns didn’t manage 200 total yards. Tyrone Swoopes was 13-of-25 for 106 yards, and was also the Longhorns’ leading rusher with 31. If you thought 2010’s drive chart was bad, 2014: Punt, punt, punt, punt, punt, punt (half), fumble, downs, punt, punt. Jake Waters was 19-of-30 for 224 yards, while DeMarcus Robinson and Charles Jones added the only Wildcat TDs. Matt McCrane hit three field goals on the way to another victory in Manhattan. 2016 – The last Texas game I didn’t see in person. Texas tried to make it close with a Swoopes TD in the third and a Dorian Leonard TD reception late in the fourth to bring it within three, but Texas couldn’t recover the onside kick. It was the first loss of a 2-4 stretch to end the Charlie Strong Era. With all this in mind, the players were asked their thoughts on Texas’ drought at Kansas State. Here are some of their responses. Though there’s been problems in the past in Manhattan, there’s trouble within the walls of Bill Snyder Family Stadium. It’s no secret Snyder wants his son, Sean, to take over as Wildcats head coach whenever he decides to step down. He’s recently been at odds with the administration on that front, but now he’s at odds with his own staff. According to a report from the Wichita Eagle, Snyder chose to put Alex Delton into the game at QB to the surprise of his offensive coordinator, quarterback coach, and replaced quarterback. He also lamented being unable to gain half a foot of yardage. The report also says Delton will likely be the starter at quarterback against Texas, but as Ian will explain this week, that doesn’t solve all the issues. Kansas State is currently 2-2 with a 27-24 win over FCS South Dakota, who is not one of the quality FCS Dakota teams, and a victory against struggling UTSA (125th in S&P+). They were defeated soundly by ranked teams in Mississippi State and West Virginia. They’re 93rd in total defense, which ranks them second in the state of Kansas in that regard. In fact, KSU is 89th in the most recent S&P+ rankings, good for one spot behind… Kansas. There’s been plenty of trouble for Texas in Manhattan, but this year’s team appears to be the least troubling Snyder team in a while.